Often in practice we "breakdown" for 10 or 15 minutes and have post players doing their drills at one end and perimeter players doing drills on the opposite end with a coach or assistant at each end. This first drill comes from Chris Collins (when he was at Duke). It features dribble-penetration and a kick to an open shooter on the 3-point arc, which is so important in today's dribble-attacking offenses. Diagram 1 shows O1 with the ball on the right wing. 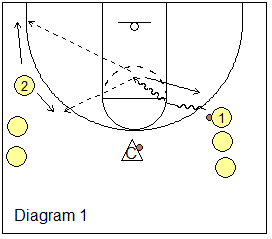 O1 dribble-drives into the paint, as if looking to score, and then kicks out to O2 on the arc. O2 has to re-locate and get open by either sliding above the ball, or fading to the corner. After passing to O2, O1 immediately sprints back out to the wing. A coach will dribble from the top and kick out to O1 (diagram 2), who re-locates on the right arc. O1 and O2 will both get 3-point shots. See the video for details. 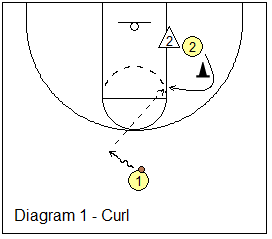 This is another drill from Chris Collins. 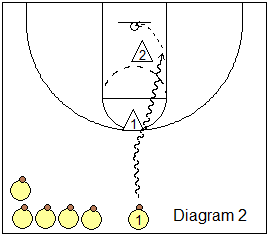 The first part features pull-up jump shots in transition as the defender is retreating (diagram 1 below). The shooter starts at half-court and speed dribbles as if to attack the top defender. As the defender retreats, the shooter pulls up for the jump-shot. He gets his rebound and goes to the back of the line at half-court. Continue until your shooters make 5 or 6 in a row. 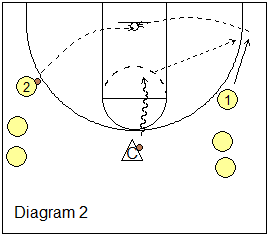 The second part of the drill has the defender coming up to the arc to stop the shooter (diagram 2). The shooter makes a quick cross-over dribble and attacks around the defender to score a lay-up. The shooter should try to get to the hoop with just one dribble once he/she has beaten the top defender. Usually in a game, there will be second defender down low to beat. So here Collins has the shooter use an "extended" lay-up with the shooting arm outstretched to avoid the block, almost like a hook shot release. This drill is from legendary coach Bob Hurley. It teaches players how to read the defender when coming around a down-screen. The cutter has three options depending on what the defender does... (1) curl around the screen, (2) pop to the wing, or (3) fade to the corner. The cutter curls around the screen (cone or chair) when his/her defender trails him around the screen (diagram 1 below). The point guard recognizes this and takes one dribble opposite for better spacing, and then makes a leading bounce pass to the cutter for a pull-up elbow jump shot. Diagram 2. Here the defender runs right into the screen. The cutter pops to the arc for a quick chest pass from O1. He could shoot this 3-pointer, or dribble-drive to the hoop. Diagram 3. The defender "cheats" and goes under the screen. The cutter fades to the corner for the over-the-top pass from O1 and an open corner 3-point shot. When doing this drill, go through each option, and then have the defender mix it up so that the cutter learns to read the correct option. 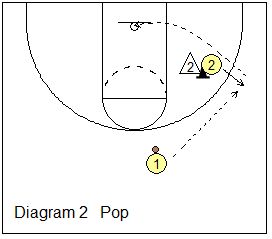 Here are more perimeter shooting drills that we use. We will go through several of these with each player getting two or three repetitions at each drill on each side. With each of these drills, we do both sides and we have our players start in triple-treat position, make a jab-step fake or shot fake, and then execute the dribble and shot as indicated in each diagram below. We teach that the left foot is always the pivot foot (for a right-handed player) and vice-versa for the left-handed player. So, when going to the left, right-handed players will make a crossover step, not a crossover dribble (which can be stolen by a defender). We watch players carefully to make sure they are using the cross-over step correctly and do not travel. 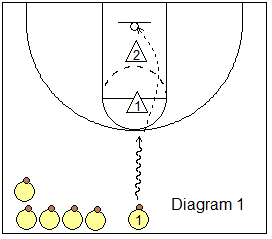 In diagram A, the first drill is a simple dribble down to the baseline and shoot the mid-range jump shot. Each player gets his/her rebound and goes to the opposite line. In diagram B, each player will dribble down to the baseline, then back-dribble out, cross-over dribble and dribble into the seam and shoot the jump-shot. This drill is important because sometimes, in a game, players will dribble down to the baseline, stop the dribble, get trapped and lose the ball. This dribble teaches them to back-dribble out of the baseline and then still find the open shot in the seam. In diagram C, it's a simple dribble move into the seam with the pull-up jump shot. For right-handed players in the right line, this will be a crossover step. In diagram D, we start with all players in the corner (use both sides). Again, it's triple-threat position, a shot fake or jab-step, and a dribble into the seam between the corner and wing for a mid-range jump shot (like in diagram B). In diagram E, we again use both sides, and pass from the point to the wing. The wing makes a V-cut, catches the pass in triple-threat position, makes a shot-fake and dribble-drives for a lay-up. In diagram F, use both sides, and pass from the point to the wing. The wing makes a V-cut, catches the pass in triple-threat position, makes a shot-fake and then a one or two-dribble adjust into either the seam or toward the baseline for the mid-range jump-shot. Diagram H. We like our point guards to dribble-penetrate, and pass out to the corner if defended inside. Here, the point dribble-penetrates, passes out to the corner, for the quick shot from the corner. Diagram I. This drill helps us execute our weave-screen plays and gets shooters ready to shoot the "3" coming off the screen and hand-off. Use both sides. You can start with the ball at the top (point), as seen in diagram I. Or, you can have the ball-handler lines start at the half-court line, and then the ball-handler dribbles to the top and then over toward the wing for the hand-off. Shoot several 3-point shots, and then shoot several one-dribble pull-up jump-shots. Next, you can do several fake dribble hand-offs with the ball-handler keeping the ball and quickly "turning the corner" and dribble-driving to the hoop. 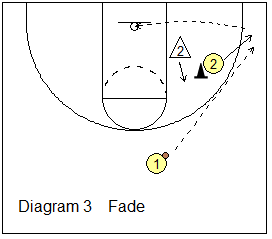 Finally, finish the weave-screen series with the receiver back-cutting for the pass and lay-up (drill #9 below - diagram J). Diagram J. This drill enforces our rule, "if someone is dribbling at you, back-cut" (except in a called weave-screen play). The point dribbles toward the wing. The wing moves out higher, holds a fist up (a signal for a back-cut), and then back-cuts quickly, all the way to the hoop. The point guard should make the pass early. It's important that whenever a player back-cuts, the back-cut must go all the way to the hoop. In a game, if the cutter stops short and the point guard makes the pass, it's a turnover. The Swish Video/DVD and the new "Swish-2" DVD, by shooting coach Tom Nordland. This is an excellent shooting DVD for players and is a great teaching tool for coaches wanting to learn how to correctly teach shooting form.